Crystals were found in my chow puppy's urine. She is now 8 month old and has been having Orijen since we have gotten her. Recently, she has been having "accidents" in the house and we thought that something must be wrong because she was normally a very good girl who didn't want to mess up her living space. Yesterday, the vet told us that there are crystals found in her urine sample, and the vet suggested to switch her food to the brands that are carried in their hospital. As far as I know, those brands usually use by products, pork fat, wheat, corn and so on. We don't really trust the quality of those food brands. I am thinking to cook or put her on raw diet, but I don't really have much knowledge about home-cooked food and raw diet. Could you please give us some advice and recipes? Your help will be greatly appreciated! Thank you. I know there is specialty veterinary food for crystals so you probably want to take your vet's advice at least until the crystals are cleared up. Once she is healthy again you can look into a raw diet. Thank you very much for your reply. You have a good point. We are bringing her to the vet again today for an ultrasound. Hopefully, her problem is not that serious. She is still very energetic and her eating and drinking is very normal, but I've stopped giving her the Orijen kibble. I cooked some food for her yesterday and we'll see what food the vet will suggest today. What a beautiful girl Lucy is. Hope she's feeling better soon. Follow the vet's advice on food to clear up the issues. But for some simple suggestions, we dont follow a raw diet, but Rory does get a boneless chicken breast (boiled) for dinner or basic hamburger patties (pan heated). For breakfast he gets low-fat cottage cheese. He used to get yogurt too, but decided he doesnt like that anymore. Obviously not everyone's cup of tea, but he get proteins without the filler and a dairy source. This was recommended by his breeder and we never changed it. He does have kibble available whenever he wants/needs it and supplements his diet when he feels hungry (probably every 2nd day or so) to keep his fiber/grain intake. Rory is a shorter, stockier male chow who last weighed in at just under 50 lbs. Weight is proportionate to muscle mass and he is healthy in all aspects. I personally chose not to feed a branded dog food after reading endless bad reports on it. I decided to feed my girl a home cooked diet. She gets white boiled rice, fish (usually mackerel or sardines in olive oil) OR low fat cottage cheese OR scrambled/boiled egg, I add in frozen blueberries, steamed broccoli, carrots the odd time & sometimes I mix in Yakult with her meal which is a probiotic milk-type product. Dakota is 9 months old now and loves her dinner, never has left any of it, her coat is so healthy and shiny! 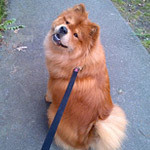 The only downside I have about feeding the way I do is it takes time to cook it but shes totally worth it, you cant put a price on a healthy happy chow! Heres a piece of information that helped me along the way, although you will need to research into it until your eyes bleed to make you confident in what you do decide to feed her! Apart from grooming, feeding is also a crucial part in raising a Chow Chow. It is important that you know your Chow dog's diet for it significantly affects your pet's health. Also, provide him with a convenient feeding schedule. 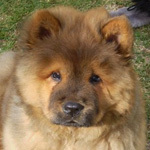 Most dog breeds love meat, but Chow Chows have a sensitive skin. Consuming a lot of meat may cause skin problems which will damage their coat. For sure, your Chow Chow needs enough protein to keep his energy flowing. You may serve him rice, eggs, and cottage cheese. It is okay, however, to give him a small piece of meat once in a while. Rice is highly recommended for it is easily digested. Dog foods usually contain preservatives and may gradually deteriorate your Chow Chow's body systems. From time to time, though, you may include chicken or stewed vegetables into your Chow's diet. You must also determine your Chow Chow's appetite. Always remember that your Chow Chow cannot overeat or his stomach will bloat, affecting his breathing, which may be fatal. He may only be fed four cups a day. You may treat him with a tidbit snack in between but be careful about what you put into his mouth. Is your Chow Chow going to digest it properly? Will he choke on it? Does it have good nutrition? Does it have preservatives? You must consider these imperative questions before feeding your dog anything. I wish you all the luck in the world with your girl, & research research research! Hi there... My chow has been fed vitality puppy since he was 2 months old. Right now he doesn't seem to like it anymore. He's now 7 months old do you think I could switch him to another brand? Any suggestions? Most dog breeds love meat, but Chow Chows have a sensitive skin. Consuming a lot of meat may cause skin problems which will damage their coat. Sorry! This is the biggest load of crock ever put into writing. 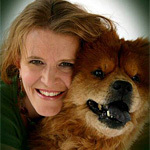 Dogs, and chows included, are hard wired by Mother Nature to eat meat, meat and more meat. They were furnished with the mouth and the teeth to process meat only. They do not have the teeth in their mouths ( like bears for example), to process / pulverize cellulose and other vegetable matter or anything else. If you want to give them other food objects, even those that offer zero bio-availability to them, fine.. but make sure they have 90% meat in their diets. A healthy, well breed, not over innoculated chow does NOT have sensitive skin either. They have healthy skin. * oye* ! Bloat is a physiological problem caused by the accumulation gas and not by overeating. Dogs with specific types of conformations are more prone to bloat because of the physical location of their stomachs. If gas gets trapped, they bloat. It has absolutely nothing to do with over eating. The ideal is to ensure they don't consume gas forming foods, like cheap kibble laden with cheap fillers, dairy products and vegetable matter. If the food doesn't cause them to produce gas.. they won't bloat. Contact Your local Chow Chow Association to find your Breeder of Merit! Nothing to add to that...Merlin has explained it quite well. 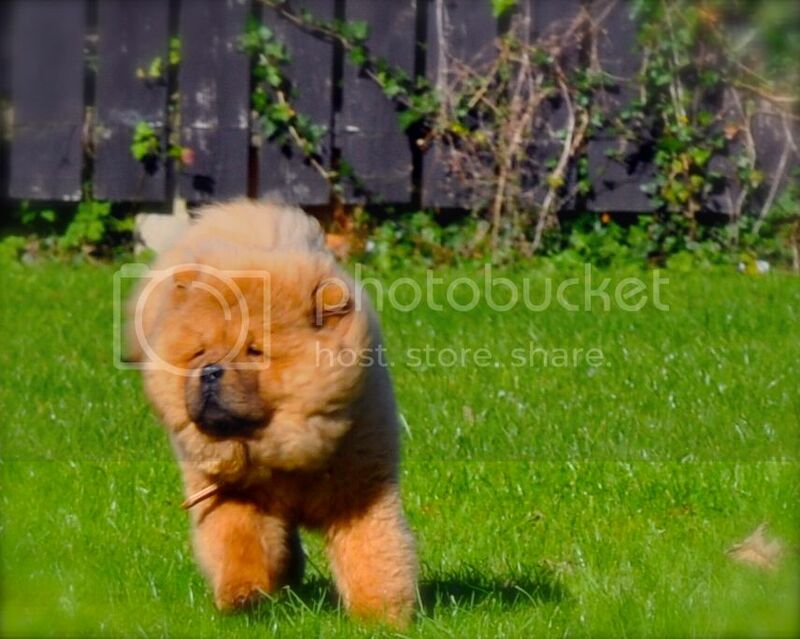 If you allow your chow to eat/drink excessively and quickly they will swallow air which will produce gas. There are other causes as well. Read not only the causes but the prevention of. Just a note: Most dogs I've read about who died of bloat ate dry kibble as their primary diet, even the high quality kibble, if there is such a thing.